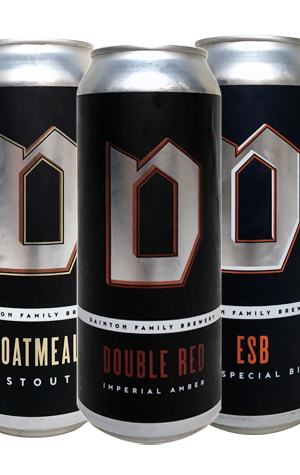 Brewery founder Dan Dainton is back at the brewing helm and appears to be wasting little time creating new beers, with no less than four appearing in black liveried 500ml cans in quick succession. One is the returning Insane Uncle IPA, which we've written about before, but the other three are new arrivals. Approaching them in the order you'd probably drink them over the evening, let's start with the ESB or English Special Bitter. Here, it's best to take Hargreaves Hill's beer of the same name as a starting point as that was the first Aussie beer brewed commercially to add a New World twist to the traditional English style. It's then best to imagine it even more New World-y as the Amarillo and Fortnight hops (the latter a blend made for local ingredient supplier Pete Meddings of Bintani) are to the fore from the off. Dan says the intention was to add stone fruit and apricot characters to the marmalade you might normally find in such a beer and you'll find some orange citrus and toffee in there too. As for the Double Red, it's of the glistening red ilk that lets you know before you've even picked up the glass that it's loaded up with plenty of everything. It's an imperial version of the brewery's flagship Red Eye Rye and, as such, delivers punchy stewed citrus and resinous hops atop a full and chewy caramel and sweet biscuit malt base. A mouthful of a beer indeed. The third of the current newcomers is an Oatmeal Stout, a beer that, unlike the ESB, keeps its feet planted firmly in the traditions of the style. Smooth on the palate with a drying roastiness balancing its dark chocolate characteristics, it's a reminder Dan can, on occasion, resist the temptation to delve deep into his stock of hops.